Richard Taylor of Winchester stands behind the door in one of the rooms that shows his Kentucky Derby collection. Taylor with his Jimmy Carter display. Richard Taylor of Winchester, Illinois has 748 mirrors. His collection was featured in a local newspaper four years ago, and since then it has grown by 300 mirrors. He began collecting 30 years ago when he needed something to do while his ex-wife shopped around in craft stores. Currently, the mirrors cover the walls of his home, and they are all organized. For instance, his Christian mirrors are in the dining room, his NASCAR mirrors share a wall in the living room, his baseball mirrors hang together by the window, his Coors mirrors gather near the stairs, and so on, and so on. Taylor finds his mirrors through traveling to different antique stores across the nation. He even bought a mirror straight off a restaurant wall. After viewing his collection, people tend to associate mirrors with the Taylor household, so every time they find a mirror, they send it to him. He has even found mirrors from different countries. Taylor keeps all of his mirrors clean averaging fifty mirrors per hour. It takes him nearly 15 hours to clean all the mirrors in his collection. Some might think it’s important to keep them clean because a dirty mirror would reduce the value of his collection. However, the value of the collection is in the eye of the beholder, for Taylor only collects what he enjoys. He describes his massive assembly as “just a fun hobby”. Meanwhile, his hobby of collecting includes Winchester memorabilia, plates, and 1200 baseball caps. Although his hobby is rather enormous, it still strays from being rather expensive. He barters for his mirrors and walks away from anything too expensive. He believes his method keeps the hobby affordable, it has only failed him once. Years ago, he walked away from a pricey Jesse James mirror, and he regrets the missed opportunity to this day. His friend, Beth Johnson, also collects mirrors. She adds to her personal collection, containing hundreds of mirrors, in her own home as well. With a shared love for the mirrors, Johnson and Taylor find mirrors for each other’s collections. Johnson enjoys mirrors that include bright colors and wild life, while Taylor fancies mirrors featuring eagles. 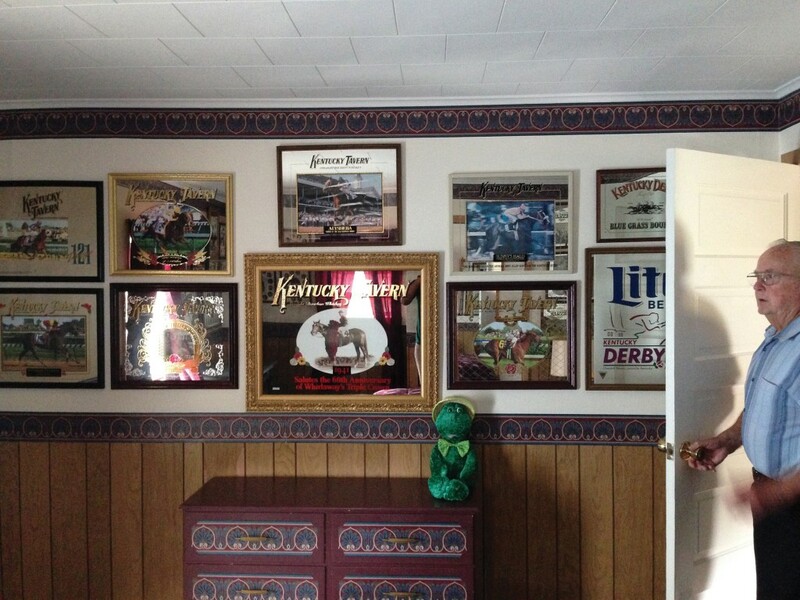 However, his favorite display includes his Kentucky Derby mirrors. Now, Taylor is looking to add more to his assortment in a new way. 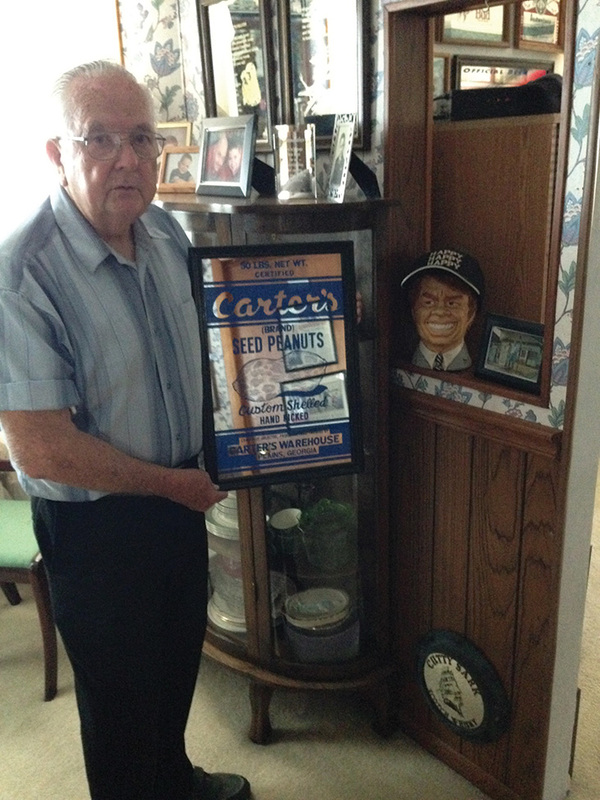 Taylor is an avid fan of Former President Jimmy Carter, and he owns a bust of Carter, as well as a Carter Seed Peanuts mirror. (Jimmy Carter earned his wealth on his family’s peanut farm before entering politics). It just so happens that the former president is coming to Illinois College on October 14th to take part in the Phi Alpha Lecture Series. Taylor hopes to get his Carter mirror signed by the former farmer himself when he comes to speak. Jimmy Carter’s autograph would add a true finishing touch to Taylor’s presidential mirror display. The autograph would also add to the monetary value of the collection. However, this would mean nothing to Taylor because to him, his collection is already priceless. Erin Washington, a native to the area, is a sophomore at Illinois College. Pursuing happiness, she enjoys playing varsity volleyball, performing in the improv troupe, and feature writing for The Source.